Pain in the front of the knee is very common. Pain in the front of the knee – or anterior knee pain will affect people in all age groups. The cause of anterior knee pain will vary based on your age. Understanding the causes of anterior knee pain is very important in order to know how to treat it. Anterior knee pain is particularly common in young women and in many runners. The symptoms of anterior knee pain vary … some of you might have very mild pain, while some of you might have very severe pain. Most of you will notice that the front of knee hurts when arising from a seated position, or when walking up and down stairs. Some will describe it as a burning pain. Others might feel clicking or popping. Sitting for a long while will typically be very uncomfortable. If the pain in the front of your knee worsens your knee may start to feel like it wants to give out, or your knee might begin to feel unstable. Many runners with severe anterior knee pain (PFPS) will no longer be able to run, especially downhill. Running downhill is actually more stressful than running uphill. Our heart might ache running uphill… but the front of the knee is under a tremendous amount of stress running downhill. Why Do I Have Pain In The Front of the Knee? There are three very distinct groups who suffer from pain in front of the knee. Chondromalacia: Chondromalacia is likely a very early sign of arthritis. It involves softening of the cartilage under your patella (kneecap). As the cartilage softens, it can become irritated with certain activities. Surgery is rarely needed. Physical therapy for lower leg, hip, and pelvic strengthening are often successful at limiting your discomfort. Compression sleeves might help minimize the pain too. Plica: A plica is a normal tissue found in 25% of knees. In some patients, the plica tissue becomes thicker and irritated. This will cause pain on the inner side of the patella or kneecap. Most people with pain due to an irritated plica will notice improvement with a period of activity modification, and over the counter medications. Injections can be useful in some cases. Surgical removal of the plica is sometimes needed… but only after all other treatments fail. Patella tendonitis: Patellar tendonitis is a common cause of pain in the front of your knee. It is a common overuse injury in sports requiring jumping and quick sprints. Patella tendonitis is common in jumping sports participants and is often referred to as a Jumper’s Knee. The pain of patella tendonitis is in the front of the knee just below the kneecap or patella. It is often very tender to touch. Patella tendinitis can resolve with a period of rest, followed by intensive physical therapy. PRP injections or surgery can be considered in situations where your pain does not improve. Surgery is rarely needed. See this post on patella tendonitis for more information. Runners Knee or Patella Femoral Pain Syndrome (PFPS) – Many runners will develop pain in the front of the knee (PFPS). This is usually referred to as a “runner’s knee”. See this post for common causes of knee pain in runners. A hallmark of the runner’s knee is that we often find nothing structurally wrong on the exam or an MRI. Pain in the front of the knee from running is not usually due to arthritis or a plica. Many runners will present with an MRI which shows a meniscus tear – but we know that a meniscus tear is usually NOT the cause of pain in the front of your knee. Most of those meniscus tears in runners can safely be ignored. We now believe that hip/core weakness, leading to excess inward rotation of the femur (see image below) is the likely the cause of PFPS. 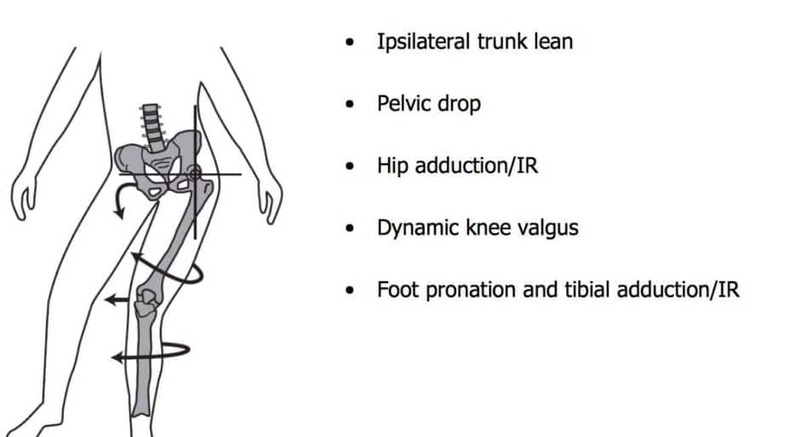 If you look at the diagram below it shows how your pelvis and hip strength contribute to your kneecap (patella) position which could cause anterior knee pain. Furthermore, surgery is almost never indicated for a runner with pain in the front of their knee. Physical therapy which focuses on hip strengthening, core strengthening and stability can alleviate PFPS symptoms in most runners. Most runners with pain in the front of the knee do not need to stop running. avoiding hilly terrain until pain has lessened. Prevention: Keep your glutes/core strong. Osteoarthritis (OA): Arthritis of the patella causes pain because the cartilage under the kneecap has worn out. Arthritis which only involves the patella in your knee is more common in women. Physical therapy can be very effective in the early stages of osteoarthritis of the patella. Read more about the treatment of early arthritis. Injections and over the counter medications may have a role in some patients. In some situations, when the arthritis is severe a patient will need to consider a replacement of the patella or a total knee replacement if the arthritis is elsewhere within the knee. How Do You Treat Anterior Knee Pain? Physical therapy is effective in managing the pain brought on by most causes of anterior knee pain. 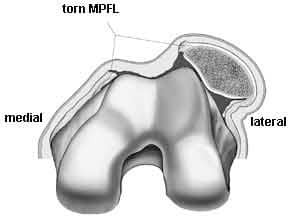 In some cases of patella instability, where the kneecap dislocates often we need to consider surgery to reconstruct the ligament which holds the patella in place. In cases of severe arthritis of the patella, we occasionally need to consider a joint replacement if you do not respond to a compression sleeve, injections, activity modification and physical therapy. Patella tendonitis or a jumpers knee will usually respond to activity modification and physical therapy. If the pain remains severe, there has been a recent interest in trying PRP injections to regenerate the patella tendon. Surgery, although rarely needed, can be very effective in severe cases of a jumpers knee. Had a post put in my left leg, from knee right down the shin bone, down the bone canal, in January. Area around knee and beneath now swelling obviously. Getting sharp nipping pain, and pain half way down shin when I walk. Advice please. Have your doctor take a look. There are many reasons why you can be having that pain in this situation. Too many to cover here…. getting knee pain on front of knee around the middle of the kneecap. I also get a sharp pain when coming up out of a squat position. the pain seems to be around the kneecap but varies from left to right of the middle. i get pain in the middle of the kneecap if i am seated at a desk with my foot off the ground and i bring my heel back towards the desk chair legs. does this sound like jumpers knee/runners knee? I was diagnosed with tendonitis but the PT tends to think I have a patellar tracking issue or pinching of fat pad. Should I get an MRI? I had an xray and ortho said no arthritis and knee looks good. any ideas ? I could be either… patients with a jumpers knee frequently have edema or inflammation of the fat pad too. If the PT is not helping then it’s worth talking with your doc about whether or not they feel that an MRI is worth pursuing. I had a knee injury about 9 years ago, several rounds of PT but never felt right- 5 years after started doing more PT and after no improvement from discomfort they decided on surgery – lateral separation with medial plication. Took a while to heal but finally started to gain strength and some mobility back. This last year and a half I’ve become much more active with the knee feeling better, with some light pick up sports and weight training 4xweekly. About a week ago the same knee started feeling achey and now is very painful when bending. If holding leg out straight pain doesn’t start till knees is bent at 90 degrees and pain continues through rest of bend. Pain is sharp and is at the top of patella from the very middle point towards the interior. While bent the area is also very sensitive to touch and pressure. Any advice or thoughts on what it may be from? If the pain persists for a while then an Xray might be useful. Tightening the patello-femoral joint (medial plication) can in theory increase risk of arthritic changes under the kneecap. I was simply jogging on cement (i don’t jog often) the other day and I started feeling a a pain in my right knee below my knee cap. Now when I walk I start feeling that pain and it persists. From the sounds of it, it can jumpers knee, although I grew up playing soccer. Now I’m starting to feel the same thing in my other knee (which I had an ACL surgery about 6 years ago), any solution? A “runners knee” is more likely… jogging rarely causes patella tendinosis (jumpers knee). A good exam by a sports doc should be able to tell the difference. About 2 weeks ago I was going down just a couple stairs in our garage and landed awkwardly, I felt immediate pain in my knee cap. I figured it would just hurt for a couple days, maybe a pulled muscle but the pain seems to be getting worse. It only hurts when going down stairs and squatting though, it doesn’t hurt when just walking. Do you think I need to get it looked at or maybe just some certain exercises could help? Julie… this is a common area to strain. if the pain persists and worries you it’s always best to have someone take a look. Hi, I did a 6 day hike that included a lot of incline and decline which caused my knee to play up and after the hike I could not go up or down stairs. I went to a physiotherapist who treated me for a sprain of MCL. In the treatment he did dry needling. The last needle he inserted on the inside of knee caused excruciating pain – a day or so later I started having a tender spot on the other side of knee that now is causing significant pain. The weird thing is that if I rub the inside of knee I can feel pain on the other side. It’s like it moves it. Over the area of pain I can rub my hand one way but if I rub and pull the skin the other way I get really bad pain. I have had a MRI and everything is ok. My doctor is now treating me for nerve damage. Is this possible? It’s now week 6 since my hike and I’m still unable to get out and walk as my knee just gets so tired by end of day. Any advice would be appreciated. Understandably without examining you this is all simply speculation and certainly not formal diagnostic or treatment advice … but should provide you with info that you can share with your local docs. Needles placed on the inner side of the knee could contact either the Saphenous Nerve, or more likely, the Infrapatella branch of the saphenous nerve. The later of the two crosses from the inner side of your knee to the outer side. Therefore if that nerve is injured, or upset then you can feel pain on the opposite side of the knee. We see this with some injuries on the inner side, and after surgery. It is not common, but can occur. Often times the symptoms will calm down over time. Nerves heal very slowly… often taking many months to calm down. If your symptoms persist after another 8-10 weeks then you can talk to your docs and see if your doc can order an ultrasound guided injection around the infrapatella branch. If that injection improves your pain then you know it is the likely source of pain. Once proven to be the source of pain, a microsurgeon (typically a plastic surgeon with peripheral nerve experience) might be able to release the nerve and help the pain subside or resolve completely. Again… this is pure conjecture and a guess given my being halfway around the world and not examining you. But I hope the info was useful.